Pakistani bridal dresses are considered as incredible and stunning throughout the world. A wedding in Pakistan is considered as religious and special occasion for the entire family and bride is expected to wear the best outfit available. In Pakistani culture, the wedding dresses are in accordance with the religion Islam and that is why they are different from the Western style bridal dresses. The most popular bridal dress in Pakistan is Lehenga. It is long skirt with substantial hand embellishments and it is worn with short shirt or blouse on top. The sleeves and the neckline can vary depending on the choice of the bride but this may change the bridal dress into a more daring outfit. Sharara or Gharara are also used as wedding dresses. These are considered as traditional Pakistani apparel. These clothes are embedded with fine and delicate embroidery made with dabka, sequins, beads, gota and diamantes work. The designers in Pakistan are making gorgeous looking bridal dresses that will surely make any bride look exquisite. Dupatta is an essential part of wedding Lehnga, it is a long scarf with heavy embroidery on its borders and spray work in the central portion. Chiffon is most commonly used fabric on these dresses, Silk or Jacquard fabrics are also used. 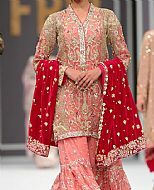 Pakistani Wedding Dresses are mostly available in Red color, but nowadays other colors like Blue, Turquoise, Sea Green or White are also used. These are the preferred colors that women like to wear and look elegant on the wedding events. Besides the wedding or nikah day, the walima function is also very important in Pakistani wedding. Walima dress is heavily embroidery as well andis very much similar to the wedding day outfit. 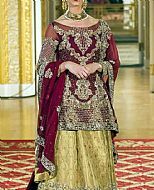 The color of walima dress is normally different. If Red is used on the wedding day, Blue, Turquoise or Sea Green colors are most probably used on the walima dress. 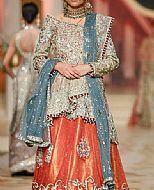 Pakistani wedding lehenga dresses are worn by ladies throughout the world. These outfits are available at online websites from where the customer in USA, UK and Europe can buy online. Jewelry and other accessories are a must with the bridal dresses. Pakistani bridal dresses are paired with heavy gold jewelry sets like necklaces, earrings, bangles and so on. They are surely made of gold and they are embedded with multi-colored stones to add sparkle and charm to the jewelry. At our website, it is very easy for women across the world to buy Pakistani bridal dresses for their special occasions. The best thing about buying Pakistani bridal suits is that you can get them tailored as per your custom requirements. Online Pakistani wedding dresses give you the option to submit your measurements as well as various styling options. These bridal suits are very graceful and practical. With our Pakistani bridal dresses, you can impress anyone. These dresses may use bright colors but freshness and enthusiasm are the keywords blended with these wedding clothes. One can easily get a wedding salwar kameez custom made at 786shop.com. You can choose from our standard sizes or use our custom size form to enter your own sizes. Browse through our Pakistani wedding dress collection, choose the one you like and select the size you need from our size chart.